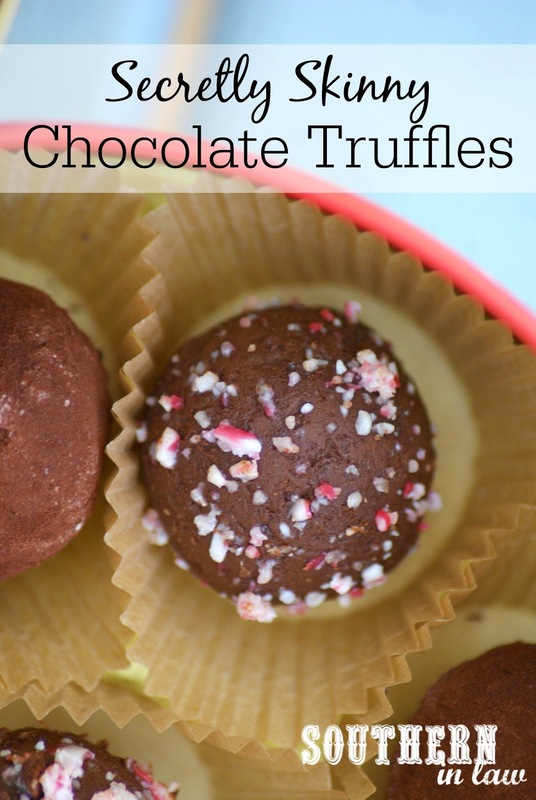 I loveeeeee Chocolate - but I never really liked chocolate truffles..... until now. A week or two ago I came home from the shops with some candy canes and the next morning, I had the bright idea to make chocolate truffles. There was chocolate in the pantry to use up, Jesse was fast asleep, the kitchen was empty and I was in need of some entertainment - so I got to work. I'd only ever made truffles once before (for our youth group kiddos) and the experience was so horrible that I vowed never to make truffles again. But this time I wanted to try something different. I didn't want to make truffles full of heavy cream - I wanted a slightly "skinnier" version with a bit of a twist. And holy yum were the results delicious! 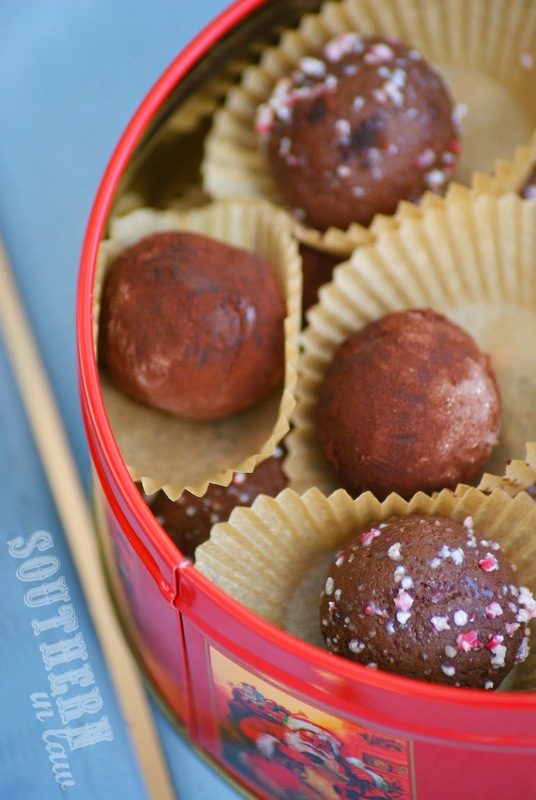 Not only were these chocolate truffles delicious to eat, they were super super easy to make. Unlike my previous experience with melty chocolate goo that was impossible to roll, this time I had made truffles that were so easy to shape and absolutely ridiculously good. 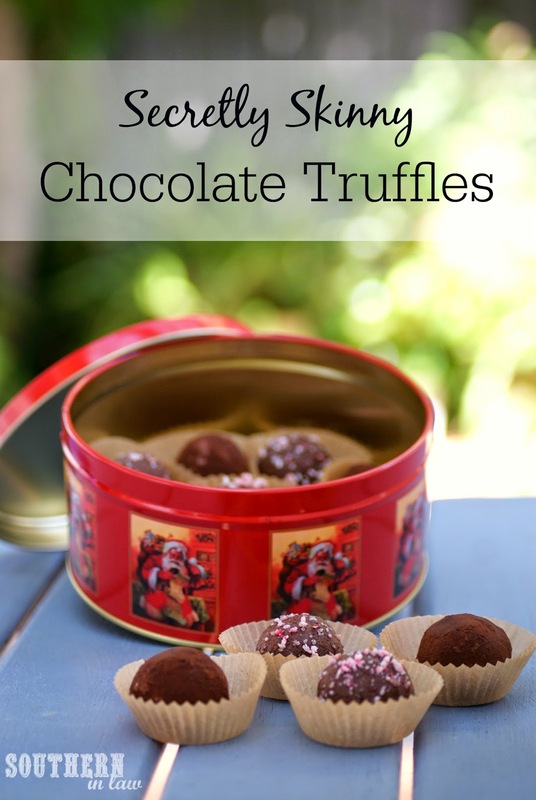 These truffles are absolutely perfect for Christmas gifting - not only are they so easy to make and absolutely delicious, you can also make them well ahead of time and freeze your shaped truffles, ready to roll in toppings before you gift them. You can roll your truffles in crushed candy canes, crushed nuts, icing sugar, an icing sugar and cocoa powder mix (less bitter than straight cocoa), sprinkles or leave them as is - the choice is yours! Crushed nuts/candy canes, sprinkles, sifted icing sugar, a mix of sifted cocoa powder and icing sugar, sprinkles etc. In a double boiler (a heat proof bowl set over a small saucepan with a small amount of water in the bottom, heated at medium heat), melt your chocolate until smooth. Add in your vanilla, mixing to combine. Carefully mix in your cream cheese, starting with just a spoonful at a time to slowly bring the temperature of the chocolate down, mixing until everything is combined. Chill your truffle mixture in the fridge for 30 minutes or until firm. Shape your truffle mixture into balls, rolling in coatings if desired. Chill your truffles on a baking sheet in the fridge for ~1 hour or until firm. The truffles are best kept in the fridge and will keep for 1-2 weeks. 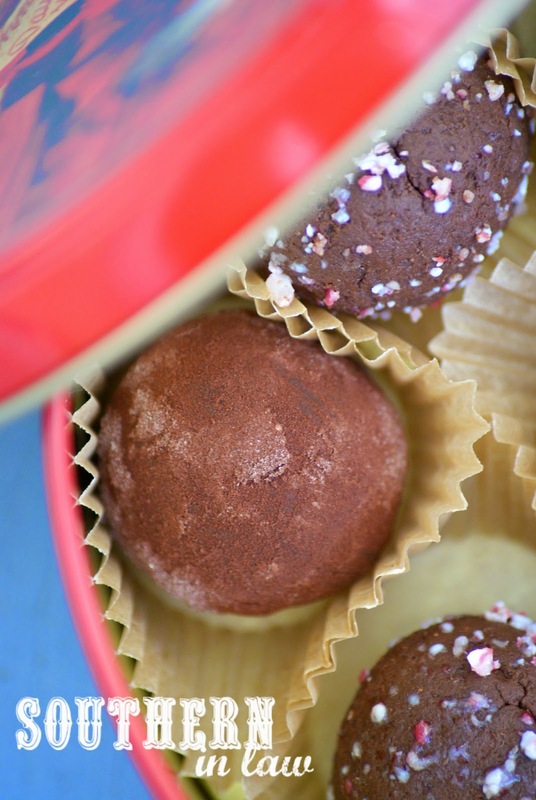 If gifting: You may freeze your rolled truffles in advance, taking them out of the freezer and leaving them in the fridge overnight ready to roll in toppings to gift. When you're ready to gift them, place them in a cute Christmas tin (this one was $3 from The Reject Shop) or jar or wrap them in cellophane, tied with a Christmas ribbon. As you can see, it's really just a matter of using an equal amount of chocolate and cream cheese - and a splash of vanilla. You can increase/decrease the recipe as you like! But tell me, what's your favourite Christmas food gift to give or receive? And what's your favourite type of chocolate? Mmmmm, now you have me wondering if I could use mascarpone in this recipe! I have the soft bLocks of cream cheese in my fridge, could these be used or do you really need the spreadable? That should be fine! Just leave them out of the fridge for 1/2 an hr or so prior to making the truffles so they can soften a bit!